I'm jazzed about another Bladerunner influenced game coming to fruition soon. Especially funny since the cops helmet looks like two Metal Gear MKII head stuck together. Coincedence or a knowing tribute to MKII's design? Can't wait to play it. CD Project RED makes only good games. I'm psyched for this game. Seeing the trailer for this made me want to replay Snatcher. And I just finished it. 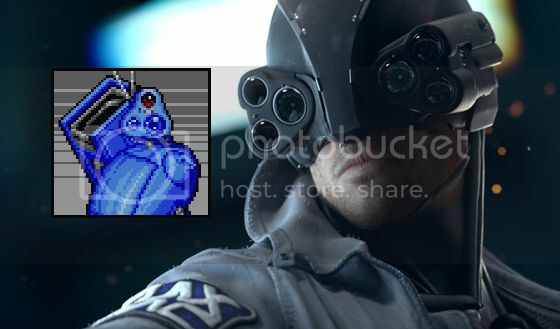 I think the goggles on that guy may very well be a Snatcher reference, just for the hell of it. I love cyberpunk stuff. The only big release in the genre recently was that terribly overpriced CYPHER text adventure game with the awful writing and even worse parser. I highly doubt it, since Metal Gear MKII's head is essentially a three lens camera. Could be a coincidence, but it's not that big of a stretch that a cyberpunk video game would pay homage in this small way to one of the most influential cyberpunk video games. 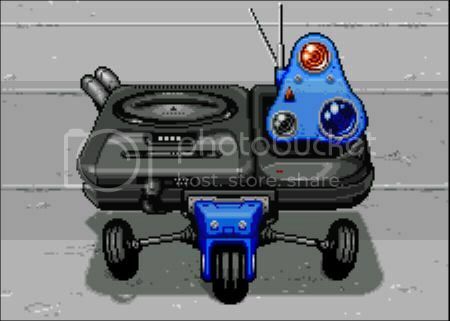 A friend of mine just started working for the company making the game as a concept artist and I had him ask the guy who designed the cop's helmet if Snatcher was an influence.